Ingredients: Chicken, Less than 2% of the following: Salt, Dextrose, Vinegar, Lemon Juice Concentrate, Spices (including red pepper & anise), Paprika, Dehydrated Onion, Dehydrated Garlic, Dehydrated Parsley, Natural Flavors. Heat a pan to medium temperature. Add 3 tablespoons of water and place links in pan. Cover the pan, continue heating for 10-12 minutes, turning the links often. Remove the cover and continue cooking for 15-17 minutes or until golden brown. Serve and enjoy! Medium temperature in a covered pan 8-10 minutes. Do you crave hot foods? When you’re a fan of fire, nothing hits the spot like a spicy Italian sausage. The peppery seasonings combined with the smoky taste of sausage will satisfy a craving for something bold. That burning feeling in your mouth tells you this food will be perfect for your next cookout! We’ve put a twist on the traditional hot and spicy sausage, however. We turned it into a patty, making it more versatile no matter what type of meal you serve. We also made these sausages with chicken, reducing the fat content to 60% less than USDA data for pork & beef sausage. With an impressive 20 grams of protein per serving, our spicy Italian chicken sausage patties will become a staple in every house that loves hot foods. These patties are good for you, in addition to tasting delicious. We make our sausages fresh and we skip the fillers so many other sausage makers add to plump out their products. Our sausage chicken patties are minimally processed, have no MSG and contain no gluten. When you’re looking for tasty meals the whole family will love for dinner, you can feel good about buying our chicken sausage patties. 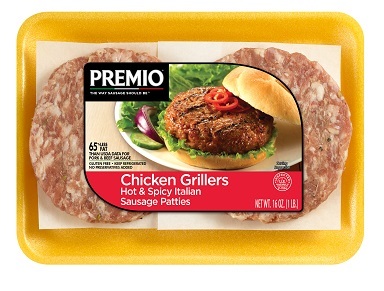 Why Pick Premio Foods for Your Chicken Sausages? We’ve been making sausage for more than 40 years. Our family-owned company offers a unique blend of commitment to quality and dedication to our customers. We believe those are two of the pillars every good company stands on. We’re also passionate about serving our community and helping our employees, many of whom volunteer for local causes on their own time. We couldn’t be prouder of them and the way they bring their high-minded dedication to work every single day. Our customers make up a wonderful part of our community. We love giving back through contributing to food bank drives and sponsoring programs that help young people. We have a long history of offering donations to charities that use that money to search for cures to deadly diseases or reach out to at-risk kids. Grill up a spicy chicken sausage patty for dinner. You can find a place near you that sells our products by using our store locator or you can order online by using our website. Stock up on spicy patties as well as trying our other products, such as turkey sausage, breakfast sausage and world flavors. Whatever you choose, you’ll get a tasty and filling meal. Enjoy our healthy chicken sausage patties that are full of flavor, spice, and heat! Premio Hot & Spicy Chicken Grillers will spice up your favorite recipes and best of all create a healthier meal. Try our hot chicken patties in our recipe for Spicy Sausage Stuffing or simply a deliciously grilled sausage burger. All of the spice lovers in your family will love Premio Hot & Spicy Chicken Grillers!